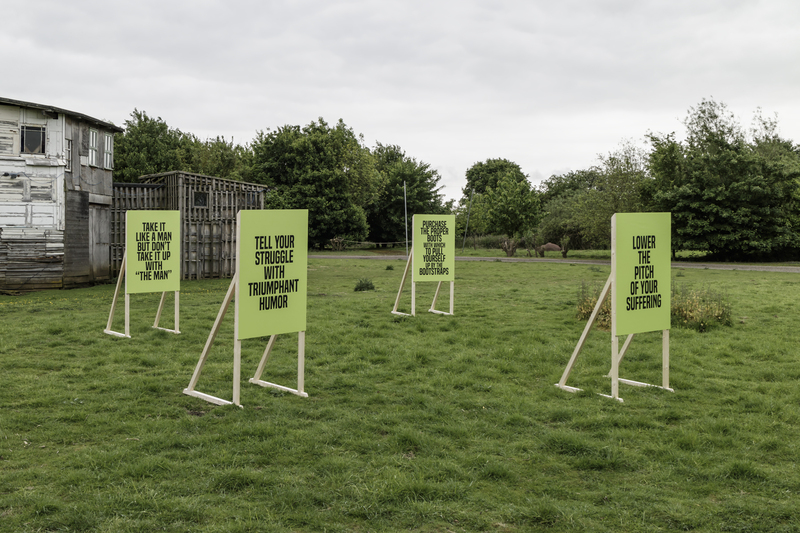 Curated by Jesse Darling and supported through public funding from Arts Council England. Click on the above image to see more installation photos. Words are powerful: symbols, incantations. The Word is itself a stand-in for divinity; the unsayable equates to the sublime. To give a name to something is to claim it, and the legacies of modern imperial scientific fundamentalism have shown the violence of naming and categorising bodies. Legibility – hailed by internet utopians, mass-marketeers and contemporary designers as a democratising prerogative – has come to function as a form of surveillance both at border controls and in digital capitalism. 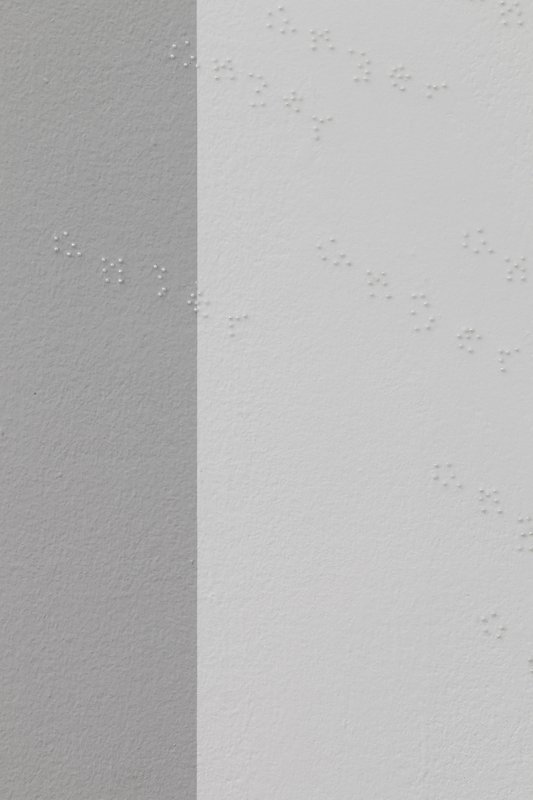 In discourses of gender and disability, legibility is the first condition [of state and systemic apparatus] for access and care, as well as forming the optics of a neoliberal visibility politics that cleaves to familiar societal categories and definitions around race, class and identity. Voracious bots plow through your testimony for windows through which to sell you a soul, compiling subjectivities into demographics like the old colonial anthropologists. “If we examine the process of ‘understanding’ people and ideas from the perspective of Western thought,” wrote the postcolonial theorist Edouard Glissant, “we discover that its basis is this requirement for transparency. In order to understand and thus accept you, I have to measure your solidity with the ideal scale providing me with grounds to make comparisons and, perhaps, judgments. I have to reduce.” And meanwhile in the para-internet storytelling culture in which narratives supercede facts on every possible level, the written word proliferates, radiates, both saturates and frustrates dialogue and community. Mene Mene Tekel Parsin brings together a number of works by international artists who employ words and language to illuminate and obfuscate, fully cogent of the propagandist deployment of slogans and the seductively tall tales of advertising copy. 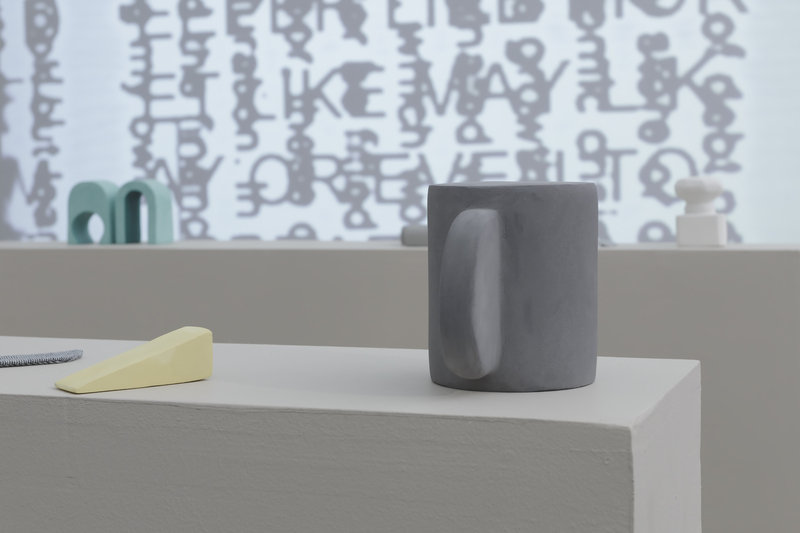 In the exhibition, words become objects, sigils and talisman, sculptures that stand in for the body (or the world). 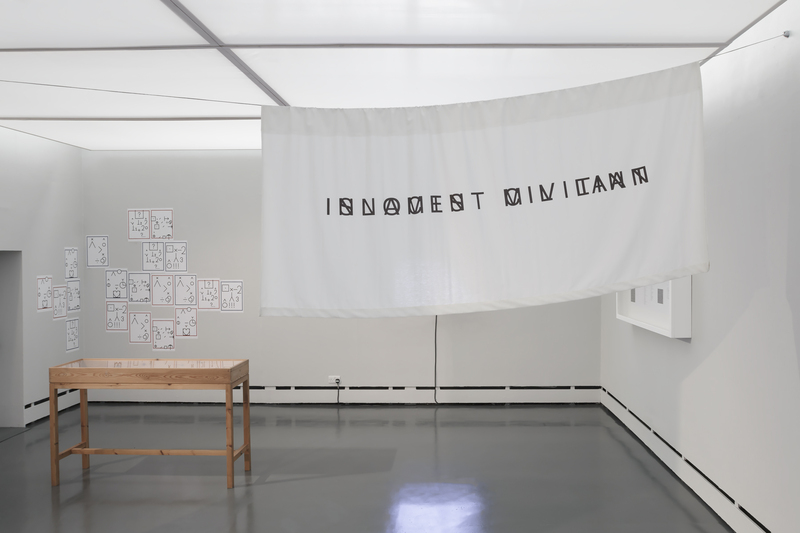 Simultaneously legible and unintelligible, and often refusing to take a definitive position on meaning, works presented as legible might hide a deeper truth in plain sight or evade straightforward signification, playing with the outside and inside of text and subtext, such as Sulaïman Majali’s sweeping banner hero/antihero, (2012). 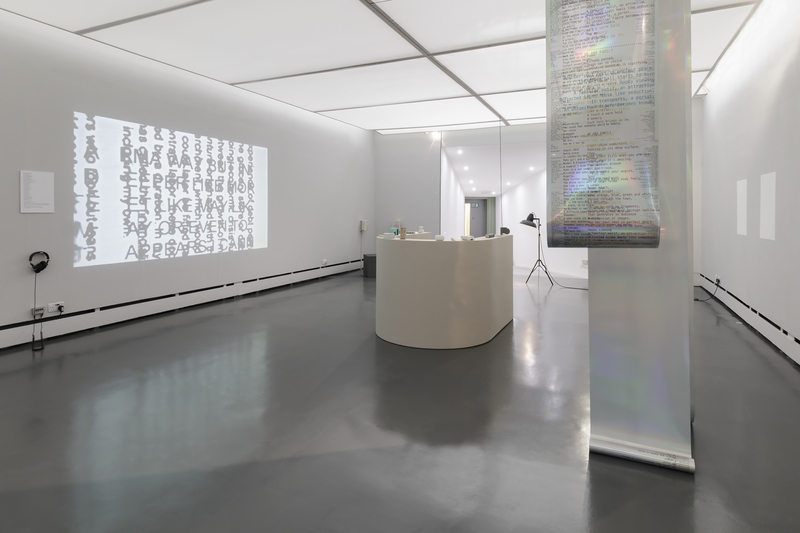 Words appear and disappear throughout the exhibition. 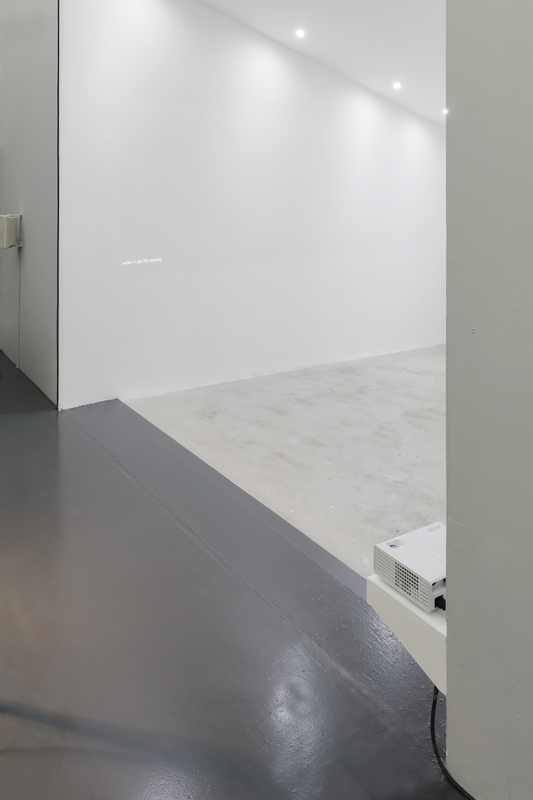 In Imran Perretta’s when i (do) fall asleep, (2017) a poem is traced in light directly onto the gallery wall and in Sarah Boulton’s how amber will fall, (2017) words come into focus when caught by glancing light. 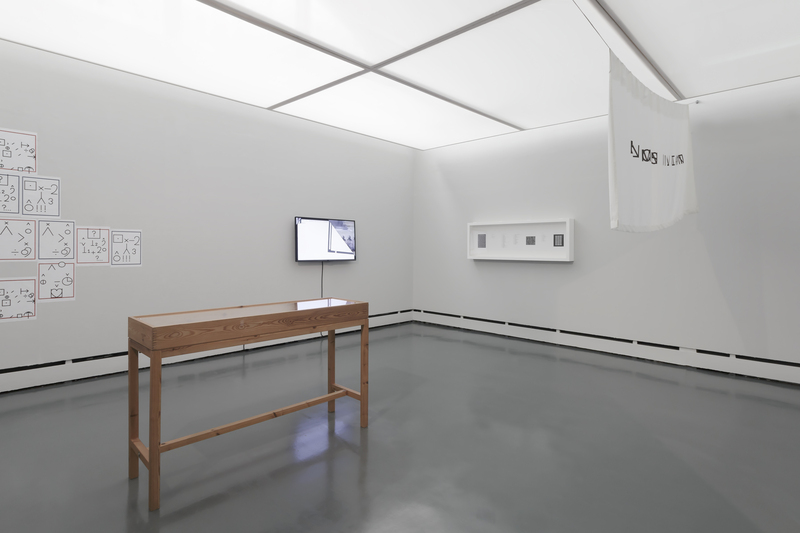 In Evan Ifekoya’s Ebi Flow (flex), (2016) multiple voices are described in three hanging scrolls of narrative text and in Rosa Johan Uddoh’s, On Opacity, (2017) two voices discuss a resistance to be defined by assumption. Resisting legibility is central to Stanley Brouwn’s work. Brouwn, who was born in 1935, has remained an elusive figure, rarely appearing in person and withholding permission for his works to be re-produced; in catalogues for group exhibitions his contribution is a blank page. Brouwn’s artists’ books describe daily actions such as walking, in precise terms, but do so without an evident authorial signature. In the work presented ell / ells - step / steps, (1998) Brouwn occludes his own body under the sign of an archaic term of measurement. 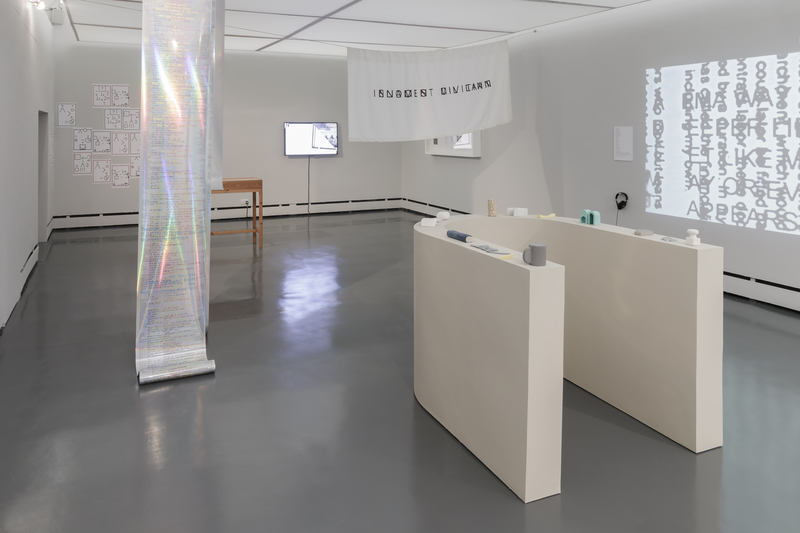 In her Code Poems, (1982) Hannah Weiner has taken the International Code of Signals “for the use of all nations”; a visual signal system for ships at sea, to enable her poems to be both interpreted and performed. Weiner (1928-1997) is associated with the Language poets, an avant-garde group who were active during the late 1960s and 1970s, and became known for developing a method of writing based around words that were clairvoyantly seen by her. Claire Potter’s fragments of script are remnants from a performance the artist made during the launch of Mene Mene Tekel Parsin. The eighteen small and torn fragments, arranged by Potter during the performance as though preparing for a tarot-reading, form a disjointed narrative that describe two incidents that speak of the relationship between two traumatic events. The American artist, writer, and educator, Kameelah Janan Rasheed offers satirical sayings that comment on how the policing of suffering, anger and responses to the trauma of racialised violence are utilised as tools to maintain social order under oppressive systems in How to Suffer Politely (And Other Etiquette), (2014-) which is presented publicly on billboard structures outdoors. 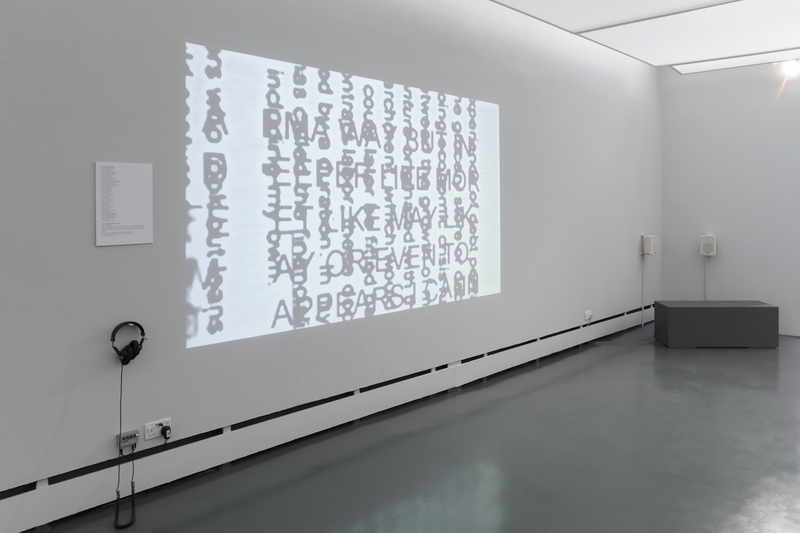 Constantina Zavitsanos’ Girl, there’s a better life (2017) includes a video projection of two letters - an application essay and a suicide note - which cross over and occlude one another, alongside a soundtrack on which two songs similarly commingle. From these crossed or lost signals, new sounds, colours, and meanings are produced. Ensuring that their work can be accessed on multiple sensory levels, an accompanying wall panel captions the sound and images, without explaining either. Özgür Kar’s, Declassified in Part, (2017) addresses the recent political reality of Turkey through a moving and powerful depiction of official, classified documents juxtaposed alongside found footage, sourced from the internet, of violence and solidarity. Jesse Darling’s graphic posters spell out messages in Bliss symbols, identified through the work’s titles. Blissymbolics is a communication system originally developed as a utopian project by Charles K. Bliss (1897-1985) as a Jewish refugee in Shanghai during WWII. Inspired by Chinese pictographics, Bliss hoped that his 'semantographs' would help to facilitate democratic international communication through a non-spoken language. Blissymbolics found their first application in assisting children with physical disabilities to communicate. 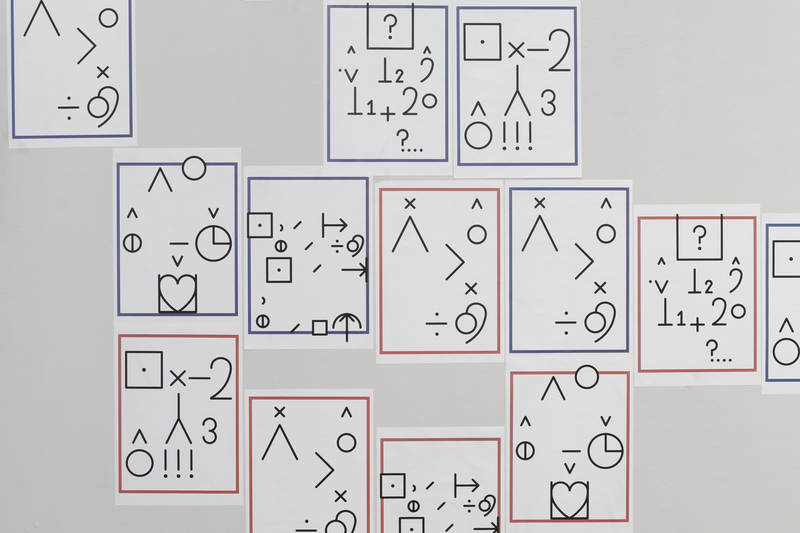 Today Blissymbolics is used mainly in Special Needs education and is currently composed of 5,000 graphic symbols, though as a generative language it continues to grow. Shirley McNaughton, who first popularised the use of Blissymbolics in disability communications, was advisor on Darling's project. 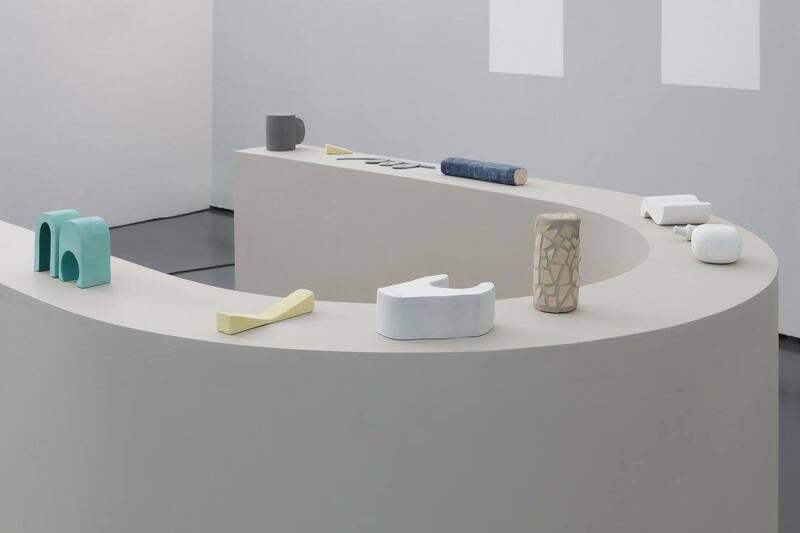 Gordon Hall’s U, (2017) presents a series of hand-scaled objects arranged on a U-shaped plinth to form an open-ended object sentence. These small carved, cast, sanded, and sewn sculptures compose a meditation on the intimacies of shared spoken and material languages, oriented around our hands as that which hold and also tell. A screening event accompanies the exhibition and will take place at Somerset House Studios, London on 22 June, 6-8pm. The programme includes works by Sonia Boyce, Hamishi Farah, Carolyn Lazard, Miloš Trakilović and Anna Zett.